Akram Khan has said that ‘Xenos’ will be his last full-length solo performance, that at 43, his body is no longer up to such rigours. It’s hard to believe as you watch this searing, 65-minute piece, a centenary tribute to the millions of non-British soldiers who died fighting for this country in WWI. 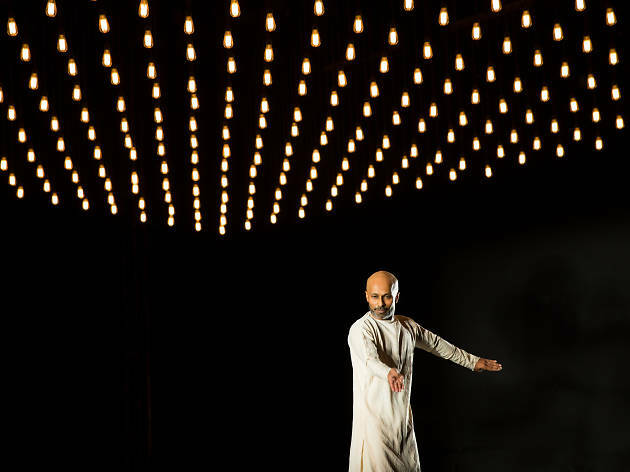 Khan throws himself into his role, often literally: tumbling and stumbling on the stage as a shell-shocked sepoy in the trenches, bewildered, mud-streaked, terrified, fusing kathak and contemporary styles with haunting poignancy. ‘Xenos’ begins with a classical Indian music performance presented as though at a nawab’s garden party, with Khan as the kathak dancer. On an incline behind him and the two musicians, ropes are stretched down and coiled as though in a peacock’s tail pattern. 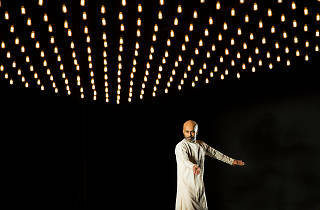 As the sharp lines of Khan’s immaculate classical dancing become increasingly fractured, and reality starts to intrude on this memory, those ropes retreat up the slope, dragging everything on stage with them, as though Khan’s stable life were being sucked over the top and into the abyss. Khan’s ghungroos (bell-covered anklets), unwound from his ankles, become puppet strings, jerking him cruelly across the stage, then cartridge belts across his torso. This dancer has been flung into war. When Khan the soldier appears, there is a heart-rending combination of panicked fastidiousness and wild recklessness in his movements, and a swirling surreality to his experiences. A gramophone offers the names of Indian soldiers; Khan, looking tiny and vulnerable, keeps returning to fashion dirt into a forlorn little mound, like a persistent Prometheus. Fragments of kathak re-emerge in the choreography, the shreds of this soldier’s identity. Musicians above the stage, seeming to hover in black space, blend terrifying dissonance, traditional Indian music, shards of WWI tunes and Mozart’s ‘Requiem’ – booming noises of conflict resolve into kathak rhythms. And the final coup de théâtre is overwhelmingly sad. Everything about ‘Xenos’ (which means ‘stranger’ or ‘foreigner’) is powerful, not least its message about those whose war stories haven’t been remembered. Khan’s striking, beautiful lament does them proud, and is an extraordinary way to wind down a solo dance career.